City and province of Lombardy, Italy. The Jews first settled there during Roman times. A commemorative stone, dating from the fifth century, probably comes from a synagogue. 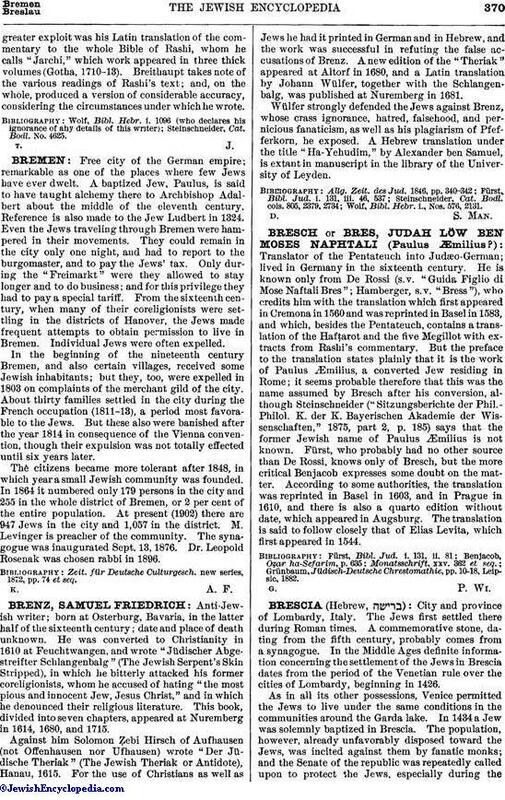 In the Middle Ages definite information concerning the settlement of the Jews in Brescia dates from the period of the Venetian rule over the cities of Lombardy, beginning in 1426. As in all its other possessions, Venice permitted the Jews to live under the same conditions in the communities around the Garda lake. 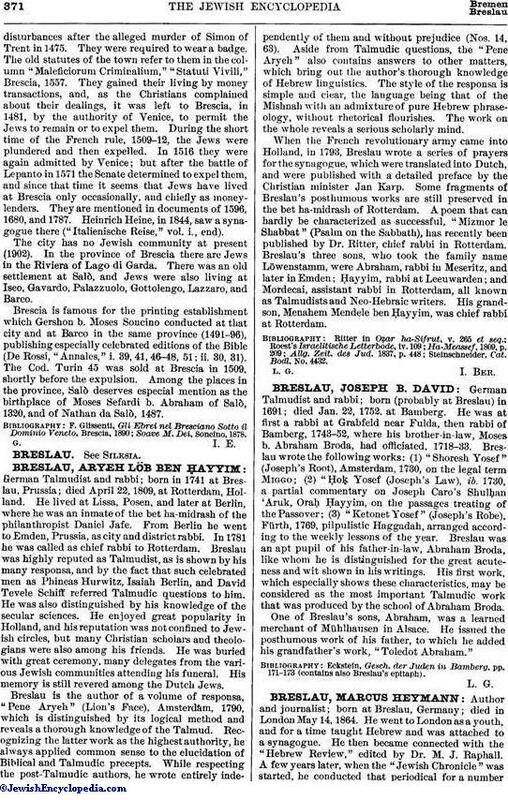 In 1434 a Jew was solemnly baptized in Brescia. The population, however, already unfavorably disposed toward the Jews, was incited against them by fanatic monks; and the Senate of the republic was repeatedly called upon to protect the Jews, especially during thedisturbances after the alleged murder of Simon of Trent in 1475. They were required to wear a badge. The old statutes of the town refer to them in the column "Maleficiorum Criminalium," "Statuti Vivili," Brescia, 1557. They gained their living by money transactions, and, as the Christians complained about their dealings, it was left to Brescia, in 1481, by the authority of Venice, to permit the Jews to remain or to expel them. During the short time of the French rule, 1509-12, the Jews were plundered and then expelled. In 1516 they were again admitted by Venice; but after the battle of Lepanto in 1571 the Senate determined to expel them, and since that time it seems that Jews have lived at Brescia only occasionally, and chiefly as money-lenders. They are mentioned in documents of 1596, 1680, and 1787. Heinrich Heine, in 1844, saw a synagogue there ("Italienische Reise," vol. i., end). The city has no Jewish community at present (1902). In the province of Brescia there are Jews in the Riviera of Lago di Garda. There was an old settlement at Salò, and Jews were also living at Iseo, Gavardo, Palazzuolo, Gottolengo, Lazzaro, and Barco. Brescia is famous for the printing establishment which Gershon b. Moses Soncino conducted at that city and at Barco in the same province (1491-96), publishing especially celebrated editions of the Bible (De Rossi, "Annales," i. 39, 41, 46-48, 51; ii. 30, 31). The Cod. Turin 45 was sold at Brescia in 1509, shortly before the expulsion. Among the places in the province, Salò deserves especial mention as the birthplace of Moses Sefardi b. Abraham of Salò, 1320, and of Nathan da Salò, 1487. Soave M. Dei, Soncino, 1878.